Jesse Delos Jewkes was a singer with a distinctive bass voice and had roles in some of Hollywood’s first sound pictures. He eventually appeared in hundreds of movies. Jewkes was born on October 21, 1895, in Orangeville, Utah. His parents encouraged music in their home, and Delos worked delivering milk in his rural community to earn money to buy a violin. After his father was elected state treasurer and auditor, Jewkes moved with his family to Salt Lake City, where he had increased opportunities to attend opera and theatre performances. Delos set aside further musical pursuits to serve as a missionary to South Africa for The Church of Jesus Christ of Latter-day Saints, of which he was a member. He accepted his call in April 1915 and stayed until July 1919 due to travel restrictions associated with World War I. He had been allowed to bring his violin with him. Upon his return, Delos worked as a traveling salesman for a Salt Lake City music company. He married Belle Gardner in April 1920, started a farm, and then moved back to Salt Lake City, where he worked as a deputy in the Utah State Auditor’s office and became a featured basso profundo soloist with the Mormon Tabernacle Choir for four years. 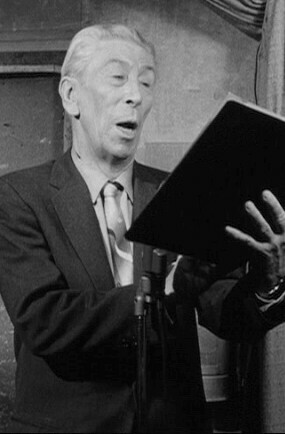 When he went backstage to talk to one of the performers after a Brandon Light Opera Company performance, the stage manager heard his voice and asked him to join the company, which began the rest of his career that spanned churches, opera, theatre, vaudeville, radio, recordings, movies, television, advertising, and Vitaphone shorts (talkies). He appeared in virtually all of the Nelson Eddy-Jeanette MacDonald musicals. He sang in The Wizard of Oz. He sang the part of the fishmonger in Hans Christian Anderson with Danny Kaye and a townsfolk singing about trouble in River City in The Music Man with Robert Preston. He was the singing minister in True Grit with John Wayne, and although it was supposed to be kept secret, he was the voice of God in Cecil B. De Mille’s The Ten Commandments. His last Hollywood movie was Bedknobs and Broomsticks—he was part of the home guard defending the coast of Dover. Many of his roles were uncredited. For many years, he sang in the choir and as bass soloist for the Founders Church of Religious Science in Los Angeles. He was frequently introduced as “our Mormon friend.” He had a range of five octaves below high C.
Jewkes continued to perform in theatre and opera and was praised for his best-known role as Pooh-Bah in Gilbert and Sullivan’s The Mikado. He moved back to Utah in 1973 and, although in his 70s and 80s, found a renaissance of his singing career with requests to sing in concerts and other performances. His final concert was given on July 11, 1984, with the Days of ’47 celebration. He was 89. Five days later, on July 16, 1984, he passed away in Provo, Utah. This page was last edited on 24 January 2019, at 17:32.